If you love rock climbing shoes, we need you to read this. The only good news for climbers to know that there are more quality products and styles to choose from than ever before. This time, impressive new models like La Sportiva Solution and Evolv Shaman which represented one of the favorite shoes among rock climbing lovers. Well, there is something for every climber in this article. What is that? To help you choose the right option between those two shoes, so for those looking for a starter shoe, check out our article with title La Sportiva Solution vs Evolv Shaman. La Sportiva Solution is an aggressive and unique design of rock climbing shoes. It is designed for performance on sport climbs and boulder problems. The edges are working well especially in retaining great sensitivity. 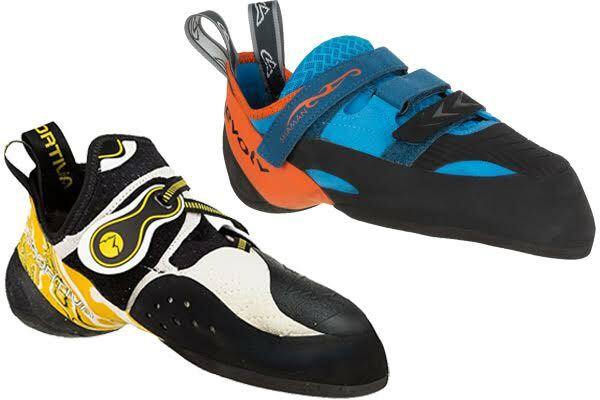 Even the old series are much more chosen by another rock climbers, but if you want a shoe with the ultimate bouldering or sport shoe, you should try La Sportiva Solution. It has unique fast-lacing system that will help you to get the shoe on and off fast while making it fit just as precisely as any traditional lacing system shoe. It also uses the upcoming technology named Lock Harness to create a support system which wraps the foot and offer a more secure fit while heel hooking. All performance shoes for steep rock should have this. The Solution also has a great heel cup shape, completely covered in rubber, that excels at all types of heel-hooking. Evolv Shaman is launched in 2016 and also a good shoe for a beginner. This shoes is an excellent redesign and the designer was Chris Sharma. Evolv Shaman rock climbing shoes are suitable for you to enjoy with the ste and endurance sport routes in limestone. The performance is incredible especially in that kind of terrain, dominating small pockets, toeing in on positive crimps, toe hooking on tufa-like-features, and heeling on small edges. It is also a super sticky and performs very well once you get used to it. On the other hand, the synthetic upper of the remodel maintains a tighter fit over time than the old leather, and the straps from Evolv Shaman were thinned out to give more room for toe rubber. The love bump, meanwhile, is a physical bump in the midsole that sits under the ball of the foot. The intention is to help support your toes by filling in the dead space underneath them. What a really good shoe with a affordable price it is! The similarities between La Sportiva Solution and Evolv Shaman can be seen on the toe hiking rubber which worked about the same on most toe hooks. While the differences can be seen on the cost that each shoes are offered, Evolv Shaman has the higher one. But, in a case, La Sportiva Solution is bad on the design because, the design works best if you size this shoe really small. It’s not a “wear all day shoe”. Seems like Evolv Shaman is more comfortable one.